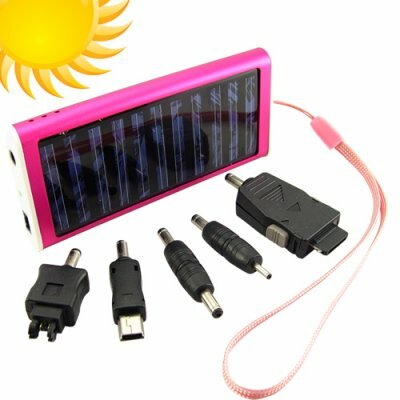 Successfully Added Solar Battery Charger for Phones, Cameras, USB Devices (Pink) to your Shopping Cart. Solar Battery Charger for Phones, Cameras, USB Devices (Pink) lets you charge all your electronic gadgets anywhere, anytime. If you are tired of your electrical gadgets dying right when you need them the most, then you will love this solar battery charger. This charger may be little (and pink), but it can charge any device that charges through mini USB, such as cell phones and PDA's, cameras and camcorders, MP3 and MP4 players, GPS devices, and even portable gaming systems like the PSP! There are also four adapters to charge some popular brand mobile phones. You will love the convenience of being able to charge all your electrical devices any time you want, anywhere you go. Using this solar battery charger is easy. Before you go out, charge the battery in one of three ways: connect to your PC via the USB cable, plug the AC adapter into an electrical outlet, or place the charger in direct sunlight. Charge it with your computer while you're at work, or stick it in your dashboard while you're driving. No matter how you charge it, this solar battery charger will be ready when you need to charge your phone, camera, MP3 player, and other gadgets. This battery charger is great for emergencies and everyday convenience. Plus, it's cute! Purchase a sample for yourself to see how wonderfully the CVBS-S07 works, then order in bulk for even better savings. From the leader in factory-direct high tech gadgets, Chinavasion. Is this device a battery or just a charger? This device is a battery. You can charge it up through USB or the solar panel, and it will store the charge. What kind of devices can I charge with this solar battery charger? You can charge mobile phones and any device that can charge through mini USB, such as cameras, MP3 and MP4 players, GPS devices, and numerous other gadgets. Can I use this solar battery charger straight out of the box? Depending on how long the device has been inactive, you may have to charge it fully the very first time you use it. How good is the solar panel on this charger? on 2009-11-10 22:21:09 si ricarica anche alla luce delle lampade di casa! piccolo, elegante, ottimo prodotto per fare un regalo di stampo ecologico! Mi ha stupito il fatto che si ricarica anche con la luce artificiale dell'illuminazione casalinga! grazie chinavasion! Product is wonderful. Mu customer will love this product. Received the item in 3 days. Very good service. Thank you Chinavasion.